Usually, when moving to a new state, I check out a map, look for a place that seems geographically interesting, and go from there. I’m not necessarily interested in the biggest city in that state — I’m looking for a place with character. 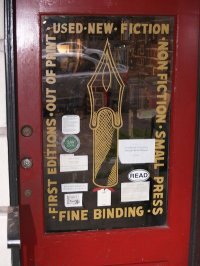 For Georgia, someone recommended Savannah to me, selling it as a beautiful spot, so I start by researching independent bookstores there. At first, I’m draw to a bookstore that looks like it’s in an historic part of town, but when I start reading the Yelp reviews, more than one person remarks about the poor customer service, so I move along. Now I find The Book Lady Bookstore http://www.thebookladybookstore.com/ which, according to its website has been around since 1978, is in a hundred year old building and is jam-packed with books. Their About page tells me that they have a knowledgeable (opinionated!) staff. Perfect. I make the call. The phone is answered by Chris Blaker who has a warm, low voice with just a hint of Southern. When I tell Chris what I’m after, he’s interested and asks if he can call me back so he can think on it a bit. Yes! I’m excited when I hear this because I figure this person is taking me seriously. 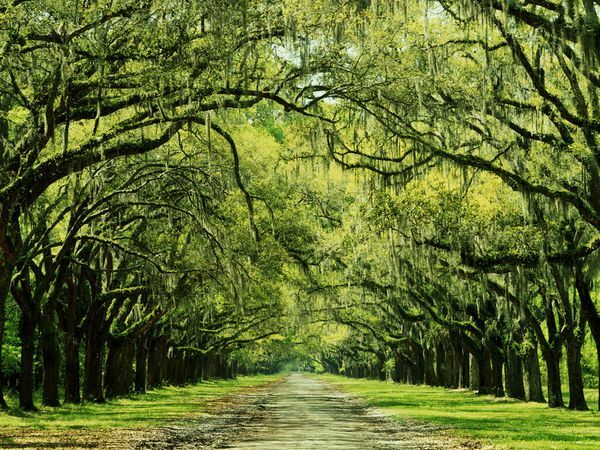 So when Chris calls me back we talk a little bit about Flannery O’Connor because the famous writer was born in Savannah and the Book Lady is involved with her historic birthplace. I’ve never read anything but O’Connor’s short stories, but Chris tells me they have a copy of Wise Blood, one of only two novels she wrote, so I ask him to send that along. Then Chris initiates a conversation about Washington writers — he wants to know who I would recommend if he were asking me and I feel how difficult it is to answer this question I’ve been asking all these independent booksellers. I tell Chris that Washington is interesting because Eastern and Western Washington are really two very distinct places and give him the names of two current authors who immediately come to mind, two very different kind of novels: The Orchardist by Amanda Coplin for Eastern Washington, and anything by Jim Lynch, The Highest Tide, Border Songs or Truth Like the Sun for Western Washington. Chris tells me that he likes a Georgia writer, George Dawes Green, and recommends his most recent novel, Ravens. Chris gives me a summary of the plot which involves a family who wins the mega-millions lottery jackpot and someone else trying to steal the money from them. “It’s dark.” He tells me. Fine, I say. You like it? Send it along. But Chris also wants to know more about my project — am I writing an article? I explain about the blog and he wishes me well. When I hang up, I’m smiling and hope the post office is quick with their delivery. When my package arrives from Savannah, it feels like my birthday. 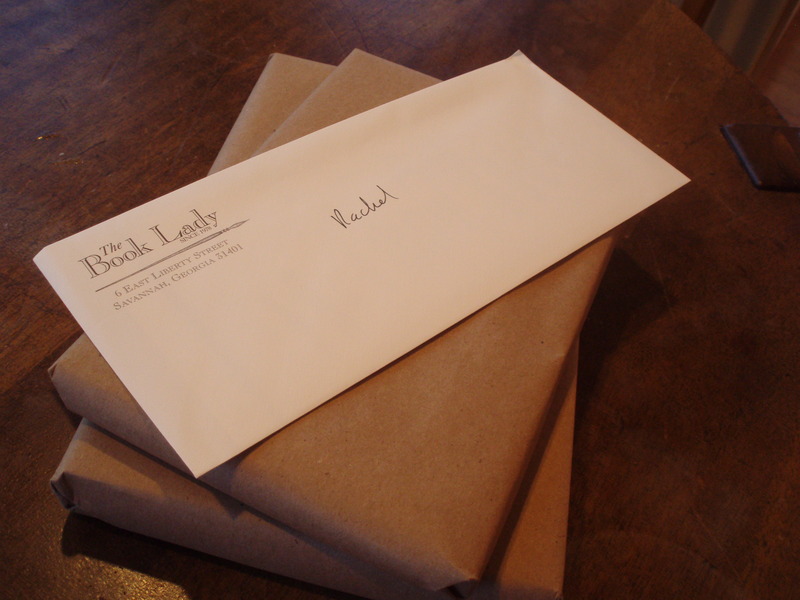 The books are wrapped in brown paper and include a personal note from Chris. In it, he thanks me for picking The Book Lady Bookstore “out of all the bookstores in Georgia” and promises to follow the blog and again wishes me good luck with my project. This just might be my first first-hand experience with Southern hospitality and I like it. Now, I need to get reading. Yawl come back now, hear?